College football season is upon us and the tailgating parties have begun! If you have an Oregon Ducks fan in your life, YourNW has the perfect collection of gifts to celebrate fall. We make more than 20 edible gifts, emblazoned with green-and-yellow U of O labels and ready to ship! 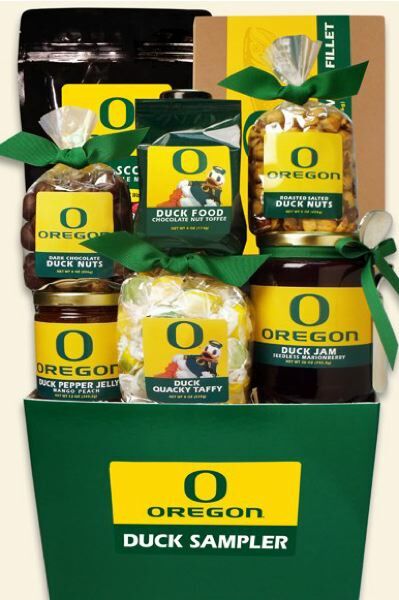 The Duck Sampler Gift Pack, $79.99, includes an array of delicious Duck treats sure to make any Oregon fan smile. Gift pack includes roasted salted nuts, chocolate nut toffee, dark chocolate-coated nuts, Marionberry jam, pepper jelly and more, cello-wrapped in a green box with a bow. Go Ducks Gift Pack, $59.99, includes our Marionberry jam, smoked wild salmon fillet, mango peach pepper jelly, dark chocolate hazelnuts, scone mix and hazelnut toffee. Duck Tailgater Gift Pack, $39.99, includes Marionberry BBQ sauce, Marionberry chipotle BBQ sauce, Marionberry pepper jelly and chocolate nut toffee. Be a Duck Gift Bag, $29.99, includes a smoked wild salmon fillet, water crackers, Marionberry jam and taffy. Or send a collection of a la carte items chosen by you, ranging in price from $2.99 to $15.99. See the whole collection at yournw.com - and don't forget to order some Duck-fan goodies for yourself! For more great delicious gift packs and other fun gifts visit www.yournw.com today!